If you are looking to buy a good Android tablet for your children, then the best choice is Meep Oregon tablet. 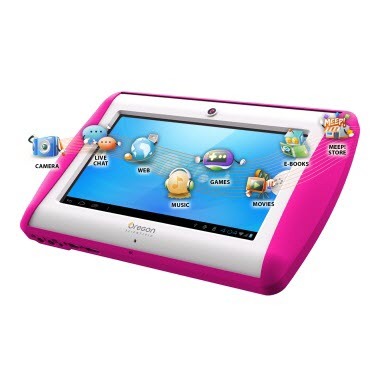 It is especially made for kids; using this tablet you can educate and entertain your children. What makes MEEP! very Special? Because, it is one of the cheapest kids tablet ever available in the market based on the Android Operating System and it costs around $149.99. Apart from it costs, the bright orange silicon bumper help kids keep a grip on the MEEP! It is also available in Meepto Pink and Meepadelic Purple for the children’s who are not the great fans of orange color. 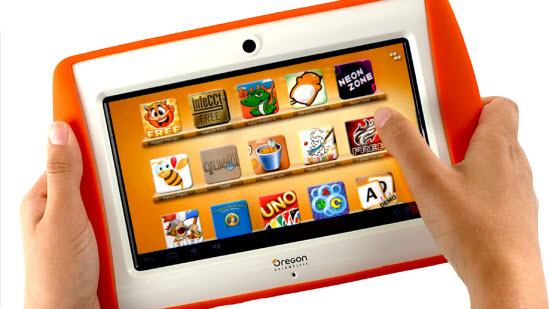 The MEEP Oregon tablet is based on cloud based parental control. By logging into the Parents Portal, they can control the Meep tablet at anytime, anywhere. Additionally, parents can block the sites to access which are unsafe to their children. Yes, they can set up a whitelist, ensuring that their children can only visit certain websites, and conversely they can set up a blacklist of “bad words” and search terms. Oregon Scientific keeps its own blacklist as well, making sure kids only see appropriate content. I think this facility makes this tablet so special. MEEP Oregon is one of the best entertaining tablet for their kids. It comes with preloaded software like Angry Birds, Toon Goggles and UNO etc. Options are provided for the kids to download additional kid-safe content from the MEEP! Store. Along with this a number of accessories are available for the tablet, which includes a joystick, a piano, a microphone and headphones to listen music and steering wheel for gaming and drum pads. It includes the 7 inches display screen providing a maximum resolution of 800 x 480 pixels resolution. It’s powered with 1 Ghz Cortex A8 processor and includes the 512 MB of RAM with 4 GB of internal memory storage capacity with 0.3 mega pixel camera on the front side. It also includes a micro SD card slot to expand the storage further more if 4 GB is not enough for you. It runs on the Android latest version of the 4.0 Ice Cream Sandwich operating system and its get the Wi Fi internet connectivity for internet access and can stram to a television via its built in HDMI port. This tablet is for the kids above 6 years and its currently available in the market retailers and online vendors.